Putting on a wetsuit was the most difficult part of the day. But once we got in the cave I realized just how essential it was. We waddled into this little cave like a bunch of tele-tubby-like creatures with our helmets and tubes not knowing what to expect. When we first plopped in the water it didn’t feel like the excursion would be that challenging, but them we were put into some tight situations. At one point we had to float plank style under this cave wall and just minutes later we side stepped the “blender” which would have taken us down the stream, and it wouldn’t have been exactly “smoothie” sailing. Then we approached the glow worms. With our butts in our tubes and our helmet lights off, we marveled at the little maggot-like species. It was the cave’s very own little starry world. 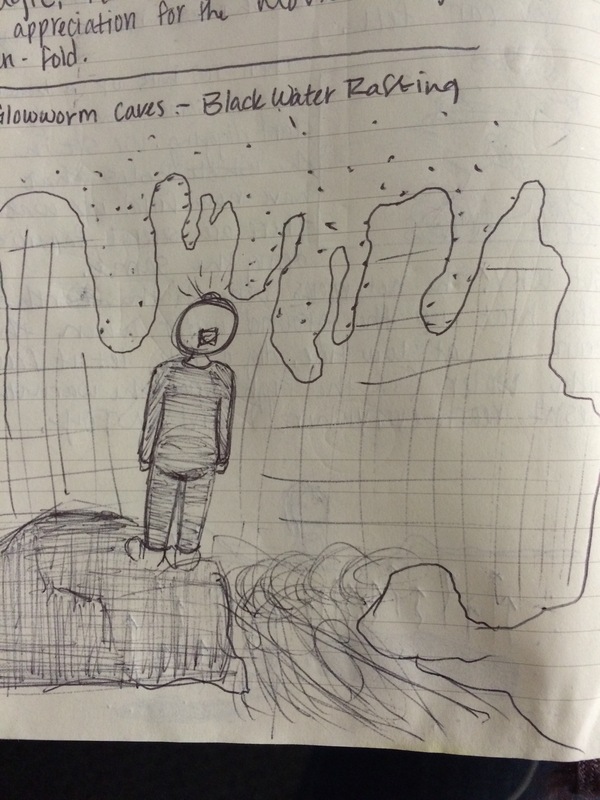 Just a quick sketch after the caves… keep in mind my hand was near frozen from the water. Tags: bayofplenty, experiences, fellowsheep, g11, tgslife, travelwriting. Bookmark the permalink.